POSTED May 30, 2018 3:22 p.m.
CRAWFORD COUNTY - The farmers of the Tainter Creek Watershed Council invite the public to a free education event on the Wisconsin Free Fishing Weekend, June 2-3. The event will take place on Saturday, June 2, 9 a.m. to 2 p.m., at Bruce Ristow’s farm, 50324 County B, in rural Soldiers Grove. A free lunch will be provided. For that weekend only, there is free fishing on all of the state lakes and streams; licenses are not required. Normal bag limits and size restrictions will still apply. 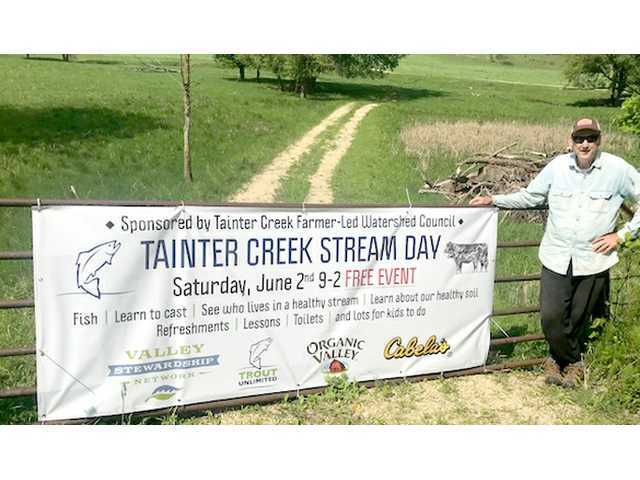 The farmers of the Tainter Creek Watershed are proud of the watershed’s excellent quality, which has allowed it to be designated as a Class One trout stream since 2003. There will be multiple education stations and fishing demonstrations for participants to enjoy, as well as food and beverages. There will be a fish shocking demonstration at 10:30 a.m., which will allow participants to see all of the different fish that are present in the stretch of water at the event site. Insects from the creek will be discussed by Dr. Jason Freund of UW-La Crosse. Fly and spin rods will be available, and casting lessons will be provided by members the Coulee Region Trout Unlimited and by noted local outdoor author Jay Ford Thurston. There will be casting games and fly-tying for kids as well. Jay Thurston will offer a spincasting demonstration at 12:30 p.m. The Mississippi Valley Conservancy will be on hand to discuss land protection and restoration efforts across the region. TUDARE (Trout Unlimited Driftless Area Restoration Effort) will discuss their work to protect the cold water watersheds in the Driftless Region and their plans for work this summer in the Tainter Creek Watershed. The Valley Stewardship Network will explain and demonstrate their citizen water monitoring program and techniques. The U.S. Fish and Wildlife Service will also provide a rainfall simulator, which demonstrates what happens with soil and runoff during small, moderate and catastrophic rain events. Tainter Creek runs through Ristow’s property. The Ristows have been longtime participants with Valley Stewardship’s ‘Water Action Volunteer’ program, which conducts water quality sampling in the Driftless Region. Ristow has also been active in supporting the activities of TUDARE activities in the watershed. The next meeting of the Tainter Creek Watershed Council will take place on Monday, June 25, 7:30 p.m., at the Franklin Town Hall in Liberty Pole. The group will discuss award of the cover crop and well water testing funds, as well as future upcoming educational events. Ray Archuleta, described as the ‘Mick Jaeger of Soil Science,’ will be brought to town by the farmers of the group for an educational experience on July 25-26. It will include a Wednesday dinner event and a Thursday field day.